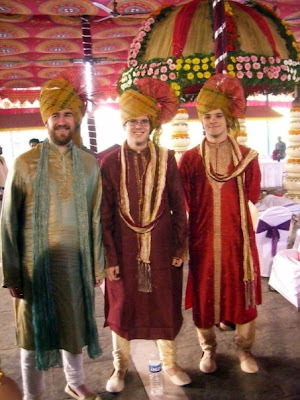 My two weeks of fun in India are over, and I'm back in DC. This isn't a travel blog, so I'll spare you discussion of the Taj Mahal, smog, Bollywood movies, beggars, Jaipur, haggling, and animals of all sorts. 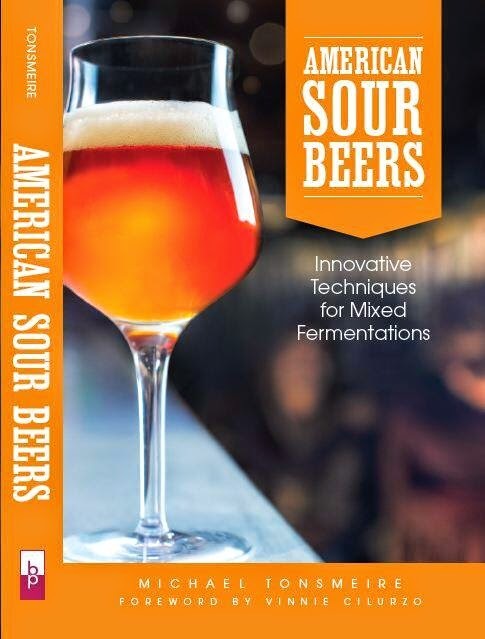 That said this is a food and fermentation blog, so I will talk about the trip from that perspective. The beer selection was as bad as (or worse than) I expected. I managed to make it the two weeks drinking just 1/2 a bottle of Kingfisher (typical bland macro-lager) and a few sips of local rum that our driver shared with us when we took him out to dinner in Agra. That said the food, and the plethora of fermented milk products, completely made up for it. The most common dairy product we had was probably the yogurt, which was part of the sauces for many (most?) of the dishes we ate (my two lactose intolerant friends on the trip really appreciated that). That said I didn't actually get to try any of the yogurt, so I can't say if it was substantially different than any other yogurt I have had before. Paneer (a fresh cheese generally translated as cottage cheese) is another mainstay in Indian cooking, particularly because it plays the meat role in many dishes at vegetarian restaurants (strangely restaurants that serve meat are called non-veg). I found the paneer much softer and more flavorful than what I have had before. Raita (which was translated as curd) is a side dish that helps to cut through the heat of spicy food. It is somewhere between yogurt and cottage cheese. 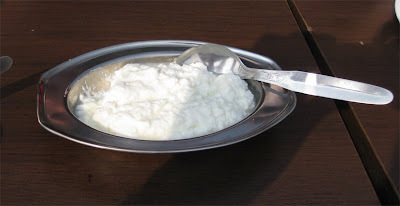 According to Wiki it is often made by partially straining yogurt (further down this road you would get yogurt cheese). It was particularly popular with puri bhaji (a breakfast of fried puffy bread and potato curry). Lassi is a ubiquitous tangy yogurt based beverage. In the states they are basically always sweet, and are generally mango flavored. In India there was always a choice between sweet and salty (plus an occasional mango option). I had them served at room temperature several times which was interesting because it really brought out a yeasty aroma (but was a bit disconcerting from a personal health angle). 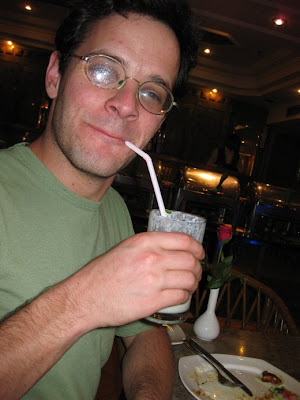 My friend Mat doesn't handle spice well so he often had a lassi to make it stop tasting like burning. 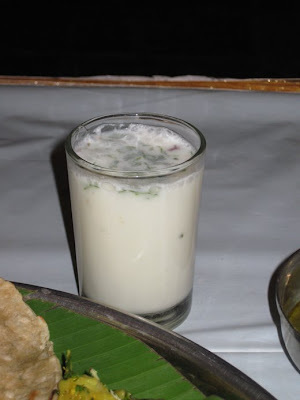 Chass is a less common (and in my opinion less tasty) drink than lassi that is traditionally drank at the end of the meal("to aid digestion"). It was referred to as buttermilk, but it was not thick and tangy like the fermented buttermilk I have always seen in America. Instead it was rather thin and flavored with salt and cilantro. It may be that they are actually using the liquid that is left behind after butter is made, but no one I asked seem to know. According to one of our guides most of these dairy products are now mostly made at large industrial dairies, so I didn't get a chance to observe any production taking place. Overall the food was excellent, and extremely cheap. For example the last meal the five of us had in Mumbai (consisting of a couple veggie dishes, biryani (flavored rice), roti (flat bread), a few bottles of water, a chai masala, and a chiku shake) came out to just over 50 rupees ($1) per person. I also found it very interesting that over our travels we saw many of the same names on menus everywhere, but the actual dishes ranged dramatically from city to city and even restaurant to restaurant. The price of food seemed to have an inverse relationship to how good it was. Some of the best food I tried was at small local restaurants or from street vendors, which always cost less than $.25 per item (we generally just ordered one of whatever was coming out of the hot pan). Luckily I avoided any major gastro-intestinal illness, although I did manage to catch a 3-day cold from one of my friends. In conclusion India is a land of many contrasts... OK one gratuitous shot of me in a turban and teal scarf. Dudes! What an awesome pic. Did you bring any interesting spices to brew with?